In a casserole, place pork chops and set aside. In a large bowl, combine sugar, 2 quarts water, salt and whisk well. Pour this mixture over pork chops and marinate overnight for best results. Remove chops and allow them to come to room temperature. Brush each chop and peach half with olive oil and season with salt and pepper. Set peaches aside and broil chops in casserole for 5 – 7 minutes on each side. Place peach halves on a baking sheet and bake for 5 minutes while chops are cooking. 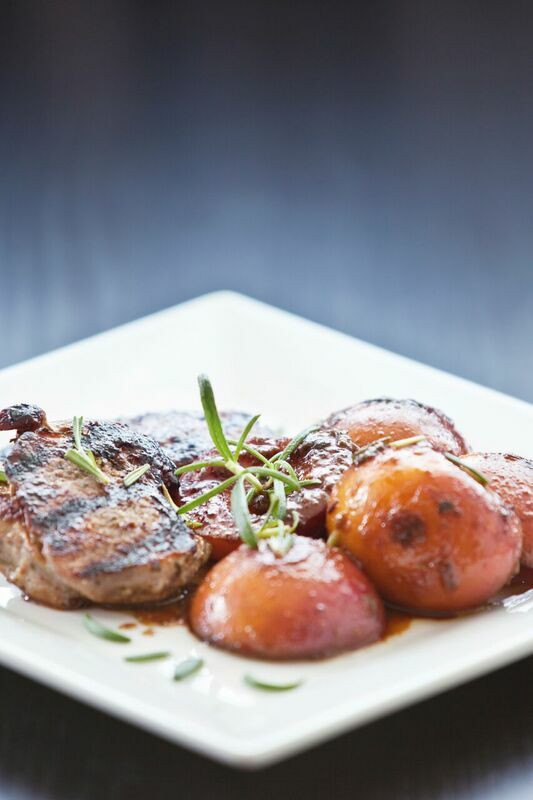 Remove cooked chops and garnish with baked peach halves and drizzle with balsamic vinegar. Serve immediately. Serves 4.